Comprehensive review of Garnier Ambre Solaire Self Tan Velvety Gel. See what real experts and actual users have to say about this self tanning product. I ended up giving Garnier Ambre Solaire Self Tan Velvety Gel 1.75 stars. So I obviously wasn’t a fan of this self tanner. I think this one is only available in the UK, I ordered it online, it only cost $3.00 for shipping which was nice. This one took foreverrrr to dry. Ultimately it took over 2 hours…that’s one of the longest I’ve seen. I felt very sticky while I was waiting for it to dry as well. That’s one thing I don’t like about gels. The product smelled mostly of DHA, but it had a small hint of fragrance as well. It wasn’t the worst smelling self tanner, but it definitely wasn’t the best. The color I got was a very light shade tan. My tan was very even and smooth though, which was a plus. I would’ve liked to see my tan be a lot darker. As the tan faded I began to look like a reptile because I became so scaly. So overall, I didn’t really like this one and I feel like there are better self tanners out there. 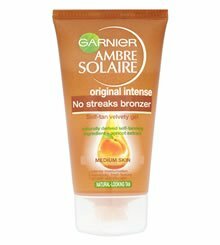 Garnier Ambre Solaire Self Tan Velvety Gel is a thick, tan colored gel. The gel has a tan tint to it, but I wouldn’t really consider it a guide as it disappears when you blend it into your skin. The gel is smooth, but it feels sticky. Applying this gel is pretty simple, I didn’t even use a tanning mitt. It goes on your skin smoothly, and there’s no guide you have to worry about blending in. Like I said before, the product is pretty sticky feeling. This one takes a long time to dry. Even after an hour I still felt sticky, and the product wasn’t dry at all. It probably didn’t dry for at least 2 hours, but after an hour I just put some pants on and went to bed. This one takes longer to dry than any other one I’ve seen. I felt very sticky and uncomfortable while waiting for it to dry. This gel smells very strongly of DHA, I can also smell a small hint of fragrance. I wasn’t a fan of the smell, but at least they put a little fragrance in there, so it didn’t smell as bad as some self tanners I’ve tried. I could still smell some DHA the next morning when I woke up. Garnier Ambre Solaire Self Tan Velvety Gel didn’t produce a very nice color. The next morning I woke up, and I had a very light tan. The color was pretty smooth and even which I liked, but the color just wasn’t dark enough. If I’m gonna feel sticky for 2+ hours, I want to receive a deep, golden tan, and I just didn’t get that with this product. I wish the color would’ve been at least a few shades darker. For me, the color this one produced just isn’t worth the dry time. There are products out there that dry twice as fast and produce better color. Garnier Ambre Solaire Self Tan Velvety Gel lasted about 2-3 days before it started to fade. As it faded it became super splotchy and unattractive. I looked like I had scales all over my body. I think this gel kind of dried out my skin as well. No, I don’t think men will really like this product. It takes way too long to dry, and the color is very light. At $3.03 an ounce, this price is pretty affordable. The bottle is $15.14, which is pretty cheap. To buy Garnier Ambre Solaire Self Tan Velvety Gel, Click Here. Look and Feel Light tan colored gel, pretty sticky. Application Application is easy and non messy. Drying Time It took about 2 hours to completely dry and it felt very sticky. Smell (Before) Smells of DHA with a small hint of fragrance. Color Produced It produces a very light tan, at least it was smooth and even. How Long It Lasts Lasted around 2-3 days before it faded and I became scaly. OK For Men? No, men should steer clear of this one. Too light and takes forever to dry. Price $3.03 per ounce, pretty cheap. The bottle is $15.14 for 5 ounces.